• The Generals wrap up the first series of the second half with the rubber match of the five-game road series against the Mississippi Braves (2-2)…the Generals have won three straight series winning 3 of 5 in each of them…are 5-4 against the M-Braves this season. • 1B Dan Paolini (1×5, R, 2B, RBI) and C John Hicks each drove in a run in the top of the 11th inning as Jackson defeated Mississippi 9-7 on Sunday. • The Generals scored 6 runs in the top of the 5th inning and held a 7-0 lead before allowing the Braves to score 4 runs in the 7th inning and 3 runs in the bottom of the 9th inning to tie the game. • 3B Patrick Kivlehan (2×5, 2 R, HR, 3 RBI) extended both hitting streak to 16 games and his consecutive on-base streak to 28 straight games, going 2-for-5 with 2 runs scored, 1 home run and 3 RBI. C John Hicks (2×4, 2 R, RBI, BB) and LF Leon Landry (2×4, R, RBI) each recorded 2 of the team’s 9 hits. • Starter Tyler Pike (5.0,2,0,0,3,2) allowed only 2 hits and struck out 2 in 5.0 shutout innings in his Double-A debut, but did not factor into the decision. RH Trevor Miller (1.2,4,4,2,1,0), RH Richard Vargas (1.1,0,0,0,1,0), RH Mayckol Guaipe (1.0,4,3,3,0,0) and RH Forrest Snow (2.0,1,0,0,0,3) combined to allow 7 runs (5 ER) in 6.0 innings in relief. Snow earned his first win after tossing a scoreless 10th and 11th innings. • 3B Patrick Kivlehan currently has a 16-game hit streak, batting .450 (27×60) with 12 runs scored, 9 doubles, 1 triple, 2 home runs, 20 RBI, 6 walks and 1 stolen base. His 16-game hitting streak is the longest streak in the Southern League this season. • After going just 4-for-35 in his first 10 Jackson games from May 10-21, Kivlehan has reached base safely in 28 straight games since May 22, batting .386 (39×101) with 17 runs scored, 10 doubles, 2 triples, 4 home runs, 28 RBI, 13 walks, 3 stolen bases and a .448 OBP. He has raised his season average from .114 to .316. 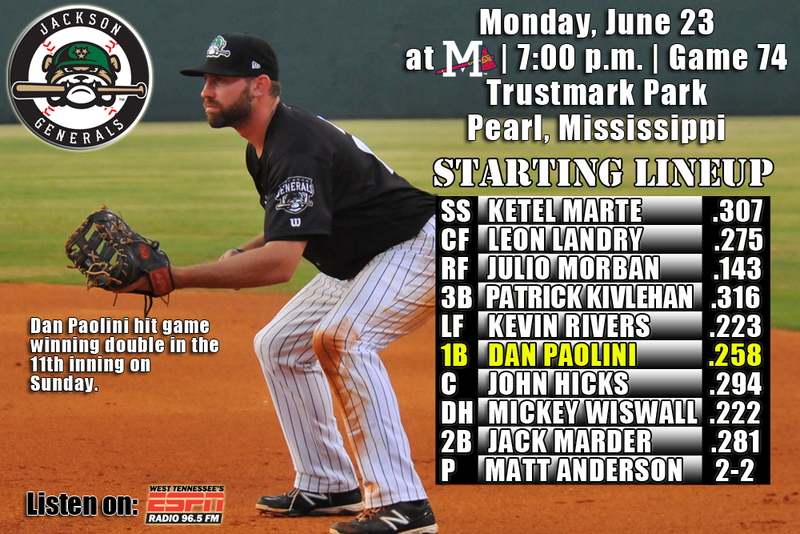 Kivlehan’s 28 consecutive on-base streak is first on the team moving past Jabari Blash (8/19/13-4/13/14) and trails only John Andreoli-TNS (30, 4/6-5/11/14) in the Southern League. • A big inning – The Generals scored 6 runs in the 5th last night matching a season high (5/11 vs. TNS, 1st). • On Top of the League in June – The Generals are tied with Mobile for the best record in the league at 11-7 in June. The .303 batting average leads the league in June and is only club over .300. This is after posting the first 20-loss month since June, 2007 by going 9-20 during the month of May. • Need For Speed – The Generals lead the league with 72 steals as a team this season. OF Jamal Austin ranks 4th in SL with 19. • Life on the Road – 3B Patrick Kivlehan (17) has the longest current road hitting streaks in the Southern League. • SS Ketel Marte currently has a 9-game hit streak, batting .375 (12×32) with 7 runs scored, 7 RBI, 1 walk and 2 stolen bases. It his his 5th hitting streak this season of at least 7 games (last: 13 G, 5/25-6/7). He has also hit safely in 22 of his last 23 games, batting .333 (31×93) with 16 runs scored, 5 doubles, 1 triple, 17 RBI, 2 walks and 4 stolen base. • Since May 24, INF Jack Marder has hit safely in 18 of 21 games with 9 multi-hit efforts, batting .364 (28×77) with 15 runs scored, 4 doubles, 2 triples, 3 home runs, 12 RBI and 5 walks. • OF Leon Landry had his 9-game hit streak end last night, but has hit safely in 9 of his last 10 games with 6 multi-hit efforts, batting .405 (15×37) with 9 runs scored, 4 doubles, 1 triple, 1 RBI, 1 walk and 2 stolen bases. • C John Hicks is batting .357 (30×84) with 16 runs scored, 7 doubles, 1 triple, 2 home runs, 12 RBI, 8 walks and 4 stolen bases in 23 games. During this stretch, since May 11, he has raised his season average from .224 to .294.